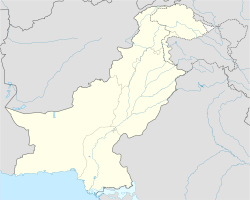 Parachinar or Pāṛačinār (Pashto: پاړه چنار‎; Urdu: پاڑه چنار‎), is the capital city of Kurram District in Khyber Pakhtunkhwa, Pakistan. Parachinar is situated on a neck of Pakistani territory west of Peshawar, that juts into the Logar and Nangarhar provinces of Afghanistan. With a distance of 110 kilometres (68 mi) from the Afghan capital Kabul, Parachinar is the closest point in Pakistan to Kabul. The name Parachinar is derived as a result of social meetings conducted under a large chinar tree. The remains of that tree are still there at a place now encompassed by the headquarters of Kurram Agency where the elders of famous tribe chamkani residing in para area used to conclude meetings under a Chinar tree to resolve their social matters. In 1893, during the rule of Ameer Abdur Rahman (Barakzai Dynasty) of Afghanistan, a Royal Commission for demarcating a Boundary between Afghanistan and the territory of British governed India negotiated terms, agreeing to the Durand line. Two parties camped at Parachinar, now part of FATA, Pakistan, which is near Khost, Afghanistan. From the British side the camp was attended by Sir Mortimer Durand and Sahibzada Abdul Qayyum, Assistant Political Agent, Khyber Agency. The Afghanistan interest was represented by Sahibzada Abdul Latif and the Governor Khost Sardar Shireendil Khan, representing King Amir Abdur Rahman Khan. On April 6, 2007, a Sunni gunman fired on a Friday prayer held by Shia in Parachinar, leaving more than 40 people dead and more than 150 people wounded. Violent clashes in the region occurred in the following week until a ceasefire was reached on April 12, 2007. Parachinar has been the target of several terrorist attacks since 2007 in which over 500 people have died, making it the second most targeted Pakistani city by militants after Peshawar. Parachinar has a moderate humid subtropical climate (Köppen climate classification Cfa) with much higher rainfall than most areas of Pakistan. Although the city's southeasterly aspect relative to the valley in which it is situated allows it to receive on occasions significant monsoonal rainfall, the most frequent source of rain is western depressions and related thunderstorms. During the winter, snowfall is common, and frosts occur on most mornings. Snow closes the Peiwar Pass, located on the Paktia border just over 20 km west of Parachinar, for up to five months per year. The population of Parachinar is predominantly Shia Muslim. As a result of many recent terrorist attacks, an estimated 60 percent of Parachinar residents suffer from post-traumatic stress disorder and approximately 40 percent of the population suffers from depression. A lack of mental health facilities in Kurram Agency has prevented many people in Parachinar from receiving treatment. Parachinar has a high suicide rate among young adults, and nearly 100 people commit suicide every year. FATA University plans to open a sub-campus at Parachinar. The Thall-Parachinar road is the main road connecting Parachinar to the rest of the country. Parachinar has an airport but currently it is non functional. In the past there was a flight service between Peshawar and Parachinar. ^ Akbar, Ali (June 23, 2017). "At least 67 dead, 200 injured in twin explosions in Parachinar". Dawn. Karachi, Pakistan: Pakistan Herald Publications. Retrieved April 11, 2018. ^ Chandran, D. Suba (July 10, 2017). "Pakistan's Parachinar Problem". RisingKashmir. Retrieved April 11, 2018. ^ "Suspected suicide blast in Parachinar; 15 killed". Samaa TV. Pakistan. March 31, 2017. Retrieved April 11, 2018. ^ "HISTORICAL AND ADMINISTRATIVE PROFILE OF THE KURRAM AGENCY". www.fata.gov.pk. Archived from the original on January 7, 2010. Retrieved April 11, 2018. ^ Ahmad, Sahibzada Zahoor (Speaker) (July 13, 2003). "100 Years of the Martyrdom of Sahibzada Abdul Latif of Khost, Afghanistan (14th July 1903 to 14th July 2003)". Hazrat Sahibzada Abdul Latif Shaheed (MP3) (Audio) (in Urdu). Lahore Ahmadiyya Movement in Islam. ^ "Deadly clashes rage in Pakistan". BBC News. April 7, 2007. Retrieved April 10, 2018. ^ "Jirga negotiates truce in Kurram Agency: Forces from across border blamed for unrest". Dawn. Karachi, Pakistan: Pakistan Herald Publications. April 13, 2007. Retrieved April 10, 2018. ^ Khan, M. Ilyas (January 26, 2017). "The little boy killed at the market". BBC News. Retrieved April 10, 2018. ^ "Parachinar Climate Normals 1971-1990". National Oceanic and Atmospheric Administration. Retrieved January 16, 2012. ^ Sirmed, Marvi (April 2, 2017). "What makes Parachinar hotbed of terrorism". Daily Times. Lahore, Pakistan. Retrieved April 10, 2018. ^ "60pc people of Parachinar suffer from post-traumatic stress disorder". Dawn. Karachi, Pakistan: Pakistan Herald Publications. July 30, 2017. Retrieved April 11, 2018. ^ Humayun, Asma (August 4, 2017). "Parachinar suicides". Dawn. Karachi, Pakistan: Pakistan Herald Publications. Retrieved April 11, 2018. ^ Mir, Rukhshan (July 25, 2017). "FATA University To Establish Sub Campus At Bajaur Agency". UrduPoint. Retrieved April 11, 2018. ^ Mashal, Mujib (June 25, 2011). "A community under siege in tribal Pakistan". Al Jazeera. Doha, Qatar. Retrieved April 11, 2018. ^ Ali, Zulfiqar (January 17, 2008). "Airfield in Wana, Miramshah upgraded". Dawn. Karachi, Pakistan: Pakistan Herald Publications. Retrieved April 11, 2018. ^ Ashraf, Syed Irfan (November 9, 2011). "The Kurram blockade". Dawn. Karachi, Pakistan: Pakistan Herald Publications. Retrieved April 11, 2018. Wikimedia Commons has media related to Parachinar. This page was last edited on 16 April 2019, at 21:31 (UTC).